As part of the foundation of the concrete footings of the new Carquinez bridge, a number of large diameter piles needed to be transported to the construction site and installed (hammered in). For the transport, a small cargo barge was selected. The transport and upending procedure was reviewed and calculations were made to determine the reaction load on the barge at any angle of upending. Based on the maximum reaction load found, the local barge structure was checked. A 3-D finite element model of the relevant barge section was made and analyzed. Barge stability at various stages of upending was also checked. Early June 2000, the first set of foundation piles were successfully transported and installed, see also the photograph below. 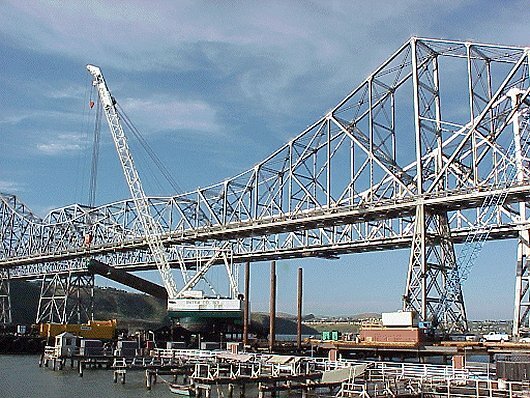 Photographs courtesy of FCI Constructors, Inc./Cleveland Bridge California, Inc. Stability check barge in various upending phases.